EVERY FEATURE REPRESENTS ADDED COMFORT FOR YOU ! .. is extremely flexible and can be applied wherever heat therapy is required. Use the convenient illuminated cord switch to choose the correct heat level. This unique cord switch offers you a choice of three heat levels, LOW, MEDIUM and HIGH. The indicator lamp and the tactile indicator help you use thermopad with ease even in the dark. Wash your thermopad Heating pad cover with complete confidence as you would any fime fabric. Washes beautifully by hand or machine. Use lukewarm water. The inner cover is water resistant and lasts for years under normal conditions. Thermopad may be easily used by an adult without another person`s help. The thermostats in this pad have been designed to minimize radio and T.V. interference. The operating cost of thermopad is less than 10 paise per hour. Thermopad will last several years if used properly and stored in its original container. Inflammatory swelling - to reduce pain and swelling. Menstrual pain - soothes fast. If you`ve ever experienced aches and pains that only warmth will relieve, if you`ve ever had heat prescribed for a particular ailment, then thermopad is the only convenient and practical way to get soothing, comforting relief. A unique button system on the heating pad control lets you choose the degree of warmth you need with a touch of the finger. Automatically holds the heat you select. Notice how easy it is to operate with one hand, leaving the other hand free to place the pad where you need it most. You can use thermopad heating pad without guesswork ! The secret ? The pad contained in this carton has three different thermostatically controlled heat levels - low, medium or high heat. With a push you can determine which heat will suit your needs. thermopad is designed for hospital/home use to operate on standard voltage not exceeding 240 volts, A.C. only. The inner cover is completely water resistant - thermopad may be applied to any part of the body requiring heat therapy for pain relief and accelerated healing. The pad should not be used on an infant, invalid, a sleeping or unconscious person unusually sensitive to heat. The area of application should be checked frequently while pad is in use to avoid burns. Temperatures sufficiently high to cause burns regardless of control setting. The inner cover should last for years. However, we recommend that you check for blistering or cracking prior to each application. For maximum life store in a dark, cool place in the original container. The thermopad Heating Pad is designed to the rigid standards of the Delta Scientific Company. We must advise you however, that careless use can result in injury and caution you to recognize the proper use of this pad. 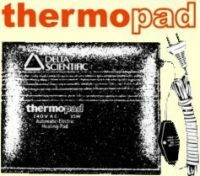 If this thermopad Heating Pad shows signs of malfunction or deterioration, such as cracking or blistering, return it to the Delta Scientific Service center nearest you. Large - 30 x 40 cms. Small - 22 x 27 cms. A four - position control switch offers a choice of three temperature settings. Three self - resetting thermal cutouts (thermostats) to completely shut off the power supply in case of overheating, due to misuse or accident. thermopad is guaranteed for two years, provided the guarantee form enclosed with the product is filled in and sent within 15 days of purchase. Warm your aches away !